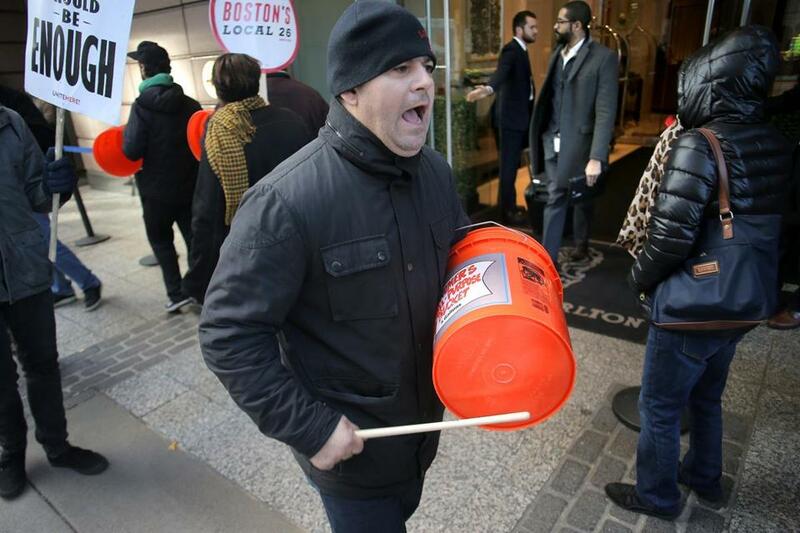 Valter Mucaj shouted union slogans outside the Ritz-Carlton Boston. Outside the Ritz-Carlton Boston, the drumming starts around 7 in the morning — every day. A block from Boston Common, just around the corner from the Boston Opera House, striking employees of the Ritz-Carlton’s parent company, Marriott, march in an oval, chanting and beating on orange buckets with drumsticks. It’s often only a couple of dozen people but in the grand tradition of public protest, they’re making an unholy racket: Anything to make sure their message is heard. It might be working a little too well. Residents of the swanky condos above the cacophony say the constant drumming and occasional brass-band section have made their homes nearly unlivable. And now, the battle between the Haves and the Have-buckets is playing out in court. This week, three condo associations representing residents of the Ritz complex sued the City of Boston, their latest effort to get officials to enforce noise ordinances that prohibit anything louder than 70 decibels, which residents say the city has refused to do. The upstairs-downstairs dynamic of the dispute could scarcely be more stark. The Residences at the Ritz-Carlton Towers, as the nearly 400 units in the Avery Street buildings above and across from the hotel are marketed, boast Brazilian cherry hardwoods, marble bathrooms, and Viking appliances. Prices for one-bedroom units are in the high six figures; most list for far more. Meanwhile, the people outside say they’re picketing because it shouldn’t take three jobs to live in a modest apartment in Mission Hill. Many are immigrants. Nearly all are people of color. “I have kids. I never see them,” said Asmeret Hagos, a housekeeper at the Ritz for about 14 years. She leaves the house a little after 5 a.m., goes from the Ritz to another job at a different hotel, and gets home just before midnight. “It’s perfectly within the rights of white millionaires to take legal action to try to silence black and brown working-class people,” said Brian Lang, president of Unite Here 26, the hospitality workers union. Given that dynamic, it’s not hard to choose a side. And as white people all over the country continue to earn stern rebukes — and mocking nicknames — for calling police on black people performing everyday activities? Well, this all sounds a little like BBQ Becky goes to court. So it is tempting to wave away the concerns of those whose lives are comparatively quite comfortable — at least until about six weeks ago, when the strike began at seven Boston hotels and in seven other cities around the country. You want to put on the Ritz? You’ll have to put up with it, too. And yet . . . it’s really loud. I wouldn’t want to live there, that’s for sure. On Friday morning, a reading on a sound meter in the lobby of one of the buildings registered over 120 decibels. Residents have also been taking videos of the protest, and in one, a man holding two megaphones in front of his face unleashes a series of screams that sound like a large animal is being tortured. Once or twice? I’d be down there marching right along with megaphone man. But seven days a week, 12 hours a day? There’s no other way to say this: I can’t. If this had been clattering away outside my house for six hours, I’d be duct-taping pillows to my head and setting up the sprinklers. It’s true. The tradition of public protest, union and otherwise, suggests that it is effective not in spite of being inconvenient but because of it. Marching in the streets was a hallmark of the civil rights movement. And it worked. 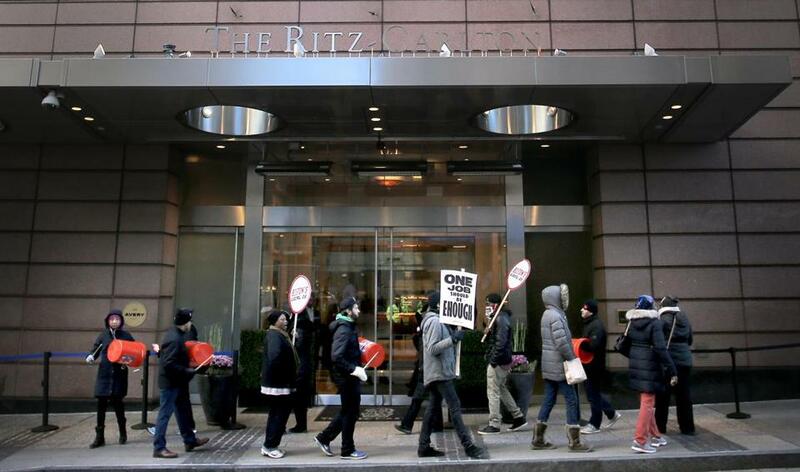 Striking members of the Unite Here 26 hospitality workers union marched and raised a racket in front of the Ritz-Carlton Boston. Whether the prolonged torment of neighbors whose connection to the labor dispute is tenuous is less clear. Some Marriott employees work in the residences, which offer luxury services from the Ritz-Carlton like housekeeping and room service, but the condos are separately owned. Others affected, such as residents of a nearby retirement home, have even less to do with the dispute. In affidavits, residents of the surrounding condos described the effect of the daily cacophony on their lives. A ninth-floor resident said she has to take her 2-year-old son out in a stroller every day to nap. A resident on the 22nd floor said he had spent thousands of dollars on hotel bills to escape the drumming. And on the 12th floor, one retired cardiologist said he is worried about his wife, who had a heart attack a few years ago. Residents of other buildings affected by the strike have complained, too. Firas Naji, a doctor at Beth Israel Deaconess Medical Center who works overnight shifts treating cancer patients, said he has been unable to sleep during the day in his Stuart Street condo above the W Hotel, which is also owned by Marriott and being picketed by the union. In the towers above the Ritz, residents have hired sound professionals to take measurements and held community meetings to complain. They’ve sent letters to the mayor — a former union leader — and the police, who appear to have cracked down on the megaphones but have done nothing more to quiet the strikers. “For political reasons, they choose not to do so,” said the condo associations’ lawyer, Ed Allcock. The city and Police Department, through a spokesperson, declined to comment. In court on Friday, Suffolk Superior Court Judge Robert Tochka appeared considerably more sympathetic to the residents’ plight than to their court papers. In an extended back-and-forth with Allcock, Tochka wondered how he would even begin to craft a court order instructing the police to enforce the law. He mused at one point that the next step would be to go out on Avery Street and point out who to arrest, discretion that Tochka said belongs to the police. He did not rule. But when Tochka turned his attention to the city’s legal team, he urged the city to find some sort of “happy medium” that did not come via court order.